Year 2017 had a bloody start in Turkey. A lone gunman, armed with Kalashnikov, entered Istanbul’s exclusive Reina nightclub, in the upmarket Ortakoy District, and indiscriminately fired at the New Year revellers, killing 39 and injuring around 70, including many foreign nationals. Located right on the banks of the Bosporus, the sprawling club was very popular with expatriates, diplomats and the Turkish elite. Eyewitnesses reported that the gunman spoke broken Turkish and accented Arabic, and that he was a trained assassin as his marksmanship was excellent. Moreover, he had several small explosives on him, which he threw at the crowd to distract them every time he reloaded his Kalashnikov.2 Forensic analysis of the spent bullets shows that the last bullet in the magazines was a tracer round, giving him notice to reload. This is a fairly advanced military technique now used by the terrorists in Syria/Iraq. The attacker reportedly managed to reload his weapon three times, without being prevented by any security personnel or the general public, and was able to fire a total of 120 rounds in a span of about seven minutes. After indiscriminately firing at the New Year revellers, the killer went into a toilet for about 13 minutes as per the closed-circuit television (CCTV) footage, where he removed his cap and coat and left his long barrelled gun behind, and thereafter came out and merged with the crowd and escaped. In haste, he left a wallet with 500 Turkish lira in his coat, which, along with the CCTV footage, and fingerprints on the gun, gave the Turkish investigators valuable leads on him. Analysis of the previous CCTV data revealed that he had visited the Reina Club about a week before on a stake out, which means he was very familiar with its layout. Suspicions have been raised as to how Masharipov was able to carry on his assault without intervention from the club’s security team, as the owner had earlier asked for police protection. It is now learnt that the killer used one of the three exits, which were being monitored by the Turkish police after the incident, and took a taxi from there.5 The terrorist also made a call from the taxi driver's phone, but the number had been unavailable for three months. The local police is of the opinion that it may have been used as a decoy. The assailant took the taxi to Zeytinburnu, 15 kms from Ortakoy District, where he went to an ethnic Uighur restaurant to get cash to pay for the taxi. This move led to rounding up of around 29 people, along with two others from the Ataturk Airport. Those arrested were Uighurs from China, Dagestanis from Russia, and Kyrgyz and Uzbeks. The arrests had yielded information that the assailant was part of a well organised sleeper cell of the Islamic State of Iraq and Syria (ISIS). He was reportedly infiltrated into Turkey by a handler codenamed ‘Teacher Yousuf’. The assailant himself had been codenamed ‘Abu Muhammed Horasani' by the Amn al-Kharji, the espionage wing of the group. In November 2016, ‘Teacher Yusuf’ had reportedly installed the killer and his family, comprising a wife and two children, in an apartment block in the town of Konya, where three other families related to the ISIS cadres were living. Turkish police conducted raids at their residences in Konya, and found a mobile phone with a selfie of the gunman taken at the Taksim Square in Istanbul, giving a clear frontal image of his face, which was quickly circulated to the airports, railway stations, etc. The ISIS message claiming responsibility for the Istanbul attack was different from the ones issued after attacks in Orlando (June 12, 2016), where 49 people were killed; in Nice (July 14, 2016), where 86 people were killed; and in Berlin (December 19, 2016), where 12 people were killed, which were described as lone-wolf attacks. It was also different from the assassination of the Russian Ambassador to Turkey, Andrei Karlov, on December 19, 2016, by Mevlut Mert Altintas, an officer in Ankara’s riot police squad. The Turkish authorities claimed that he had been self-radicalised and had no associates. Symptomatic red flags had shot up, as it indicated the prevalence of radicalisation in the Turkish armed/security services, apart from serious security lapses. Parallels, however, can be drawn with the June 2016 attack at Ataturk Airport, perpetrated by an assailant of Central Asian origin, belonging to the ISIS sleeper cell comprising Rakim Bulgarov and Vadim Osmanov, and directed by a senior Islamic Movement of Uzbekistan (IMU) fighter from the Pankisi Gorge, named Akhmet Chatayev. Parallels can also be drawn with the July 01, 2016 attack at Holey Artisan Bakery in Bangladesh, killing 29 people including several foreigners, which too was a venue popular with foreigners/diplomats in the affluent Gulshan area of capital Dhaka. Warnings of an imminent attack were there in the November 2015 issue of the ISIS propaganda magazine Dabiq, which was dedicated to the “Revival of Jihad in Bangladesh”. It was stated therein that the ISIS Bangladesh was headed by one Tamim Ahmed Chowdhury, also known as Sheikh Abu Ibrahim al-Hanif, a Bangladeshi with a Canadian passport. He later turned out to be one of the main architects of the July 2016 bakery attack in Dhaka, and was subsequently killed by the Bangladeshi forces in Narayanganj. Similarly, adequate warning had been given in the case of the Reina club attack as well. On November 02, 2016, al-Baghdadi had given a 30-minute audio message, titled, “This is What God and His Messenger Promised Us”, a reference to the 22nd verse of Koran’s Surah al-Ahzab. It referred to the coalition of the Quraysh and various tribes who lost to Prophet Muhammad in the battle of Badr, implying that the anti-ISIS coalition would similarly lose to the ‘caliphate’. He also mourned the death of the senior ISIS spokesperson Abu Muhammad al-Adnani, who was killed in Syria earlier in August, and called for attacks against Saudi Arabia and Turkey.10 The ISIS ire against Turkey developed after latter’s détente with Russia. It further sharpened as Ankara activated the Bashiqa Camp on the outskirts of the Mosul city in Iraq, which targeted the fleeing ISIS cadres. Source: Rezaul Hasan Laskar, Twitter Post, January 02, 2017, 05:51 a.m. 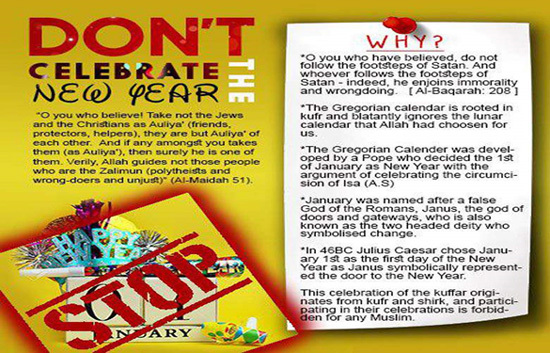 Finally, a message against celebrating the New Year eve was sent by the ISIS on December 26, on its al-Furqan channel, quoting the Quran: “O you who believe! Take not the Jews and the Christians as Auliya’ (friends, protectors, helpers), they are but Auliya’ of each other. And if any amongst you takes them (as Auliya’), then surely he is one of them. Verily, Allah guides not those people who are the Zalimun (polytheists and wrong-doers and unjust)” (5:51).13 While, the majority of Turks would distance themselves from any connection/adherence to the ISIS, the meme below has reportedly been in circulation in Turkey. The mood in Turkey today is disquieting. Since the July 2016 coup attempt, President Erdogan and his Justice and Development Party (AKP in Turkish), which is based on the ideology of the Ikhwanul Muslimeen (Muslim Brotherhood), have been publically voicing displeasure overconsumption of alcohol, which is now heavily taxed in Turkey. Several restrictions have been placed on bar licenses and vendors. The ruling AKP also disapproves of ‘Western concepts’ such as dancing parties and night clubs, and even commemorating/celebrating Christian festivals. Rhetoric certainly has its consequences, and Turkey today is a deeply polarised country. The alleged coup attempt in July 2016, said to have been masterminded by the US-based moderate cleric Fethullah Gulen, has resulted in massive erosion of government authority in the army, police, judiciary, education and administration. It is said that over 30 per cent of the work force was targeted by the government in its effort to fully quell the coup. This has led to schism within the Turkish state institutions. Turkey’s differences with the US, European Union (EU) and the NATO have impacted its internal security, by causing serious schisms within the country, which continues to have a large secular segment. It is paying a heavy price for its tolerance of Takfiri activists and their communication networks in the southern part of the country. Erdogan’s quiescence on possible continuation of Assad regime in Syria, and growing understanding with Russia, has exposed his regime to the ire of these self-same extremists, who have already established their presence within the country, enabling them to hit at the Turkish state with comparative ease. Turkey’s position as the main transit node for entering and exiting the ISIS Dawla (state), is now of paramount importance, given the probable neutralisation of the group’s territorial hold in Syria and Iraq, and possible large scale migration of Islamist fighters towards Europe and the Af-Pak region. Musa in his interrogation had also claimed that the JMB and ISIS have sizeable support in West Bengal. Burgeoning radicalism in the porous eastern border regions has serious security implications for the country, as does the growing influence of Salafism in India’s southern states. Containing these home-grown elements need initiatives beyond traditional policing. It requires close and real-time interaction with community leaders and a comprehensive and sustained counter narrative to mitigate the toxic narrative of radical Islamic groups. Last year, in 2016, scores of ISIS sympathisers were arrested by the Intelligence Bureau (IB) and the National Investigation Agency (NIA). Around 450 individuals, who are considered as potential threat, are said to be under watch.19 IB has also set up a cell to monitor online radicalisation, codenamed Operation Chakravyuh, and has reportedly been able to neutralise a number of threats. While the efforts of the security agencies are wholly praiseworthy, their tasks in view of emerging challenges remain indubitably herculean. Lapses of security, as seen in the case of New Year club attack in Istanbul, of not having adequate perimeter coverage, and real time alerts from CCTV feeds to the security network, need to be factored into India’s urban security landscape. Terrorists are now adopting innovative and indigenously encrypted communication systems, making the task of cyber security agencies quantifiably more difficult. A system for meta-data analysis is urgently required. With the announcement of ‘caliphate’ by the ISIS in June 2014, terrorism has morphed into newer forms. India’s security blueprint therefore needs to keep pace. 1. Jamie Grierson, Haroon Siddique, Graham Russell and Nicola Slawson, “Istanbul attack: Manhunt for attacker who killed 39 in nightclub – as it happened”, The Guardian, January 01, 2017. 2. Humeyra Pamuk and Daren Butler, “Gunman in Istanbul nightclub attack may have trained in Syria”, Reuters, January 04, 2017. 3. “Two Indian nationals killed in Istanbul nightclub attack: Sushma Swaraj”, Business Standard, January 01, 2017. 4. Daren Butler, “Turkey says captures nightclub attacker who acted for Islamic State”, Reuters, January 17, 2017. 5. “Turkey Detains 20 Suspects In Istanbul Massacre, Most of Them From Central Asian Countries”, ThereAreNoSunglasses, January 04, 2017. 6. Jake Wallis Simons, “Istanbul nightclub killer 'was sneaked into Turkey by sophisticated ISIS network under a secret codename and hidden in a safe house' before carrying out Turkish massacre”, Daily Mail, January 04, 2017. 7. Lizzie Dearden and Bethan McKernan, “Izmir explosion: Two 'terrorists' shot dead after car bomb and gunfire outside courthouse in Turkey”, The Independent, January 05, 2017. 8. “ISIS claims responsibility for Turkey attack”, Al Arabiya, January 02, 2017. 10. Graeme Wood, “The ‘Caliph’ Speaks”, The Atlantic, November 04, 2016. 11. Rezaul Hasan Laskar, “IS video claims Modi, Obama, Turkey’s Erdogan working against Muslims’ interests”, Hindustan Times, January 03, 2017. 12. Gareth Davies, “Sick ISIS savages film themselves burning two Turkish soldiers alive in disturbing new execution video after capturing them in Aleppo”, Daily Mail, December 22, 2016; “ISIS burns 2 Turkish servicemen alive, releases gruesome video”, Russia Today, December 23, 2016 and “ISIL video shows ‘Turkish soldiers burned alive’”, Al Jazeera, December 23, 2016. 13. Robert Spencer, “Islamic State: ‘To celebrate New Year’s Eve with the kuffar is to embrace their idolatry’”, Jihad Watch, January 03, 2017 and Vicky Nanjappa, “Celebrating New Years amounts to practising idolatry says Islamic State”, OneIndia, January 01, 2017. 14. Tim Arango, “In Turkey, U.S. Hand Is Seen in Nearly Every Crisis”, The New York Times, January 04, 2017. 15. Tim Arango, “Nightclub Massacre in Istanbul Exposes Turkey’s Deepening Fault Lines”, The New York Times, January 05, 2017. 16. “Turkey was told not to go further than 20 kms into Syria: Erdoğan”, Hurriyet Daily News, December 05, 2016. 17. “Reina nightclub attacker captured by security forces in Istanbul”, Russia Today, January 16, 2017. 18. Pooja Mehta, “Kolkata: FBI team arrives to interrogate Islamic State operative Musa”, Daily News & Analysis (DNA), December 08, 2016. 19. Vicky Nanjappa, “Year 2017: Agencies would be busy with IS recruits”, OneIndia News, January 02, 2017.